Small update: found a Mk1 IRS off of a 780. The plan is to put a BMW diff in it with the correct ratio I want (2.65:1, like the stock S600) with a factory LSD. It should mount up right to the Volvo axles. To be continued once I've found the diff I want for a reasonable price. Fun fact of the day, the S60R rear calipers bolt on without adapters. I will need the rear hubs out of a MK2 IRS though from a 960 due to the higher offset. Otherwise the S60R rotors won't fit. I'll also be making new stronger toe rods as the stock ones are made of spaghetti. It's not entirely plug and play unfortunately. I need the hubs off of a MK2 IRS due to the FWD offset they have, otherwise the S60R rotor won't fit at all. So far I've only managed to find the left one. The right one still alludes me... If anyone happens to have one, please let me know. Also the rotor needs to be turned down to 322mm instead of 330, but then it'll bolt on. I'm using FWD offset wheels anyway so with those hubs I can also get rid of the spacers in the back. For the front I've got a set of 350mm rotors from a Mercedes on the way. The 330mm Volvo R rotors won't work on the 740 with these Cayanne 17Z calipers, there is no way to make a spacer like that, but with the 350mm ones it should just work. It puts the caliper a bit further away from the hub and that should leave just about enough space to make an adapter. The 17Z calipers are normally for a 330mm rotor and the 18Z ones for a 350mm one, but besides the mounting holes and the piston sizes (17Z calipers have bigger pistons) they are the same. Brake pads are interchangable too. 18" wheels minimum though with the 350mm discs on it. Hi Sander, first of all my compliments for your courageous, incredible project. Especially the part about the R brakes draws my attention since I want to mount R calipers to my '93 960 sedan with MK1 multilink. I am also using 18 inch rims. In front with the S60R 330mm rotors + calipers using brackets from L-M-R in Sweden no problem sofar. In the back the S60R rotors won't fit like you also found out. That is why I use the 960 stock back rotor/handbrake drum to modify (cnc) as a bell and connect it onto AP Racing rotors (thickness 28 mm). These rotors have an outer diameter of 310mm, so in combination with the stock modified disc/drum I will have no offset issue and the AP disc won't interfere with the upper control arm like with the S60R rotor. That way I also maintain the stock handbrake which is a nice advantage. I was surprised to see that, compared to the front, custom brackets are not needed in the back for the S60R calipers. I noticed that you bolted them straight onto the hub wiithout using some kind of spacer. Does this leave enough space for a 310mm rotor in your opinion? I ask this since my car sits in Sweden and I cannot take measurements. Good luck with your project! Last edited by rijk; 05-15-2017 at 06:25 AM..
Hi Sander, first of all my compliments for your courageous, incredible project. Especially the part about the R brakes draw my attention since I want to mount R calipers to my '93 960 sedan with MK1 multilink. I am also using 18 inch rims. In front with the S60R 330mm rotors + calipers using brackets from L-M-R in Sweden no problem sofar. In the back the S60R rotors won't fit like you also found out. That is why I use the 960 stock back rotor/handbrake drum to modify (cnc) as a bell and connect it onto floating AP Racing rotors (thickness 28 mm). These rotors have an outer diameter of 310mm, so in combination with the stock modified disc/drum I will have no offset issue and the AP disc won't interfere with the upper control arm like with the S60R rotor. That way I also maintain the stock handbrake which is a nice advantage. I was surprised to see that, compared to the front, custom brackets are not needed in the back for the S60R calipers. I noticed that you bolted them straight onto the hub wiithout using some kind of spacer. Does this leave enough space for a 310mm rotor in your opinion? I ask this since my car sits in Sweden and I cannot take measurements. Good luck with your project! Thanks! In the back they do bolt on straight to the MK1 mounting points. I'll have to measure if a 310mm disc will work. I know that the Volvo R discs need to be turned down to 322mm to fit properly, so that´s probably the diameter you´d need too. I think AP racing makes a 320mm disc, that might be enough already. I´m solving the issue with the offset by pressing in the centers with the wheel bolts in them etc of the MK2 IRS into my MK1 hubs. The hub design is slighty different between the two so they don´t bolt in, but they both use the same wheel bearing so it should be possible to swap like that. That will give me the offset of the 960II so the R discs will work and I can get rid of the wheel spacers in the back. I´ll probably end up making adapters and use also the Cayenne calipers in the back though and sell the R calipers. Not sure yet. I´ll do some measurements when I have time and will let you know if 310mm rotors will work. Did you lower your MK1 IRS? If so, what did you use? Coil overs or something else? This will go in the front: 350mm rotor from a Mercedes R class I think and a Brembo 6 piston caliper from a Cayenne. There was no way to use the 330mm Volvo discs with these calipers on the 740. Only with the bigger 350mm disc it will work. There are 2 types of these Cayenne calipers, the 17Z ones for a 330mm disc and the 18Z one for a 350mm disc. They are pretty much identical except for the mounting points and the 17Z has bigger pistons. I'm using the 17Z ones with the 350mm disc so I had to slightly modify them to get the bigger rotor to accommodate the larger disc radius. It's really not much material that needs to be removed, just 2mm close to the edge and less further inwards, plus the 18Z calipers are already like this stock so it won't hurt anything. 18" wheels minimum though now. Thanks for replying, Sander. What a relief that the calipers fit straight onto the stock hubs. Saves me fabricating brackets. For lowering the 960 there are not much choices for the multilink mk1. I bought the - imo very nice - rear irs mk1 coilovers including the special brackets from Kaplhenke. For the front also coilovers and struts with adjustable top mounts incl deluxe steer and quick steer roll correction, also from Kaplhenke. Ask myself how you fix the handbrake when you use the larger rear discs. Using the old rotor drum? Last edited by rijk; 05-08-2017 at 12:30 PM..
Also the rotor needs to be turned down to 322mm instead of 330, but then it'll bolt on. Is that 322mm for using the - direct bolted onto the MK1 hub - rear Volvo R caliper? Last edited by rijk; 05-02-2017 at 04:20 AM.. Awesome project. Interesting to go to irs instead of a stronger live axle, given the various design issues with the irs unit. Did you consider a Toyota r220 diff as well? Why would you want such a tall gear ratio? Wouldn't you want taller to allow for better performance? Did you mean "Wouldn't you want shorter to allow for better performance?" Thanks! What design issues do you mean? The toe rods being made of spaghetti is easily changed and also the weak diff can be changed too. Finding springs that fit is easy too as it just uses standard 5" OD springs which you can get in any length and rate you could ever wish for. The difference between a car with a live axle and an irs are night and day in the corners (of which there are a lot on this side of the pond). Especially on not fantastic roads. Live axles are great on the drag strip but not much else. The nice thing about the BMW diff is that it can be found with the ratio I want, comes with a factory LSD, can handle all the power I can throw at it and the Volvo axles bolt on. I think the ones with a taller ratio than 3.something were never available in the U.S. Here the tallest one is 2.56:1. The tall ratio is because the 5th gear ratio of the trans is 0.83:1 and I don't want to be doing 3000rpm on the highway. The engine's a torque monster too so it'll have more power than traction anyway. 2.65:1 is the stock ratio of the S600 too, it'll be one less headache to get this modification registered. No complaints by the authorities that the S600 exhaust norms aren't being met anymore due to changing the ratio. This car should remain a fully usable road car, it's not going to be a toy for on the drag strip (which are almost non-existent here too). Can't wait to see and hear this! Are you factoring tyre diameter into those ratio/speed calculations? If the authorities care about RPM to speed in each gear, then they'd care about that. On the other hand, they can't stop you driving along in any non-damaging gear, so it's weird to care about that. Gotta think the big Benz ran a taller tire than the Volvo will - which would have the effect of shortening the 2.65's. Although, with a 25" tire, the .83 top gear and 2.65 rear - 70 mph is hair under 2100 rpm (assuming lock up converter). Just about exactly where I am with 3.55's, 25.3" tire and a .625 5th. No complaints by the authorities that the S600 exhaust norms aren't being met anymore due to changing the ratio. 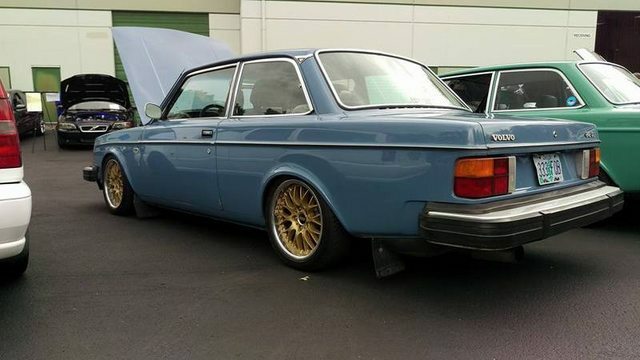 because the engine was not a stock volvo option, you are allowed to have like 3,5% co from the exhaust by the rdw people. that is if you don't have to do the expensive tech inspection in lelystad. in that case its treated like a new 2017 (if you get it ready this year ) car and it will require things like anti lock brakes and airbags and such. does your volvo have U9 on the papers? if so, it might be different but i'm not sure. 1977 245 M50B25 "Sasha Orange"
Would love to a detailed write up about the IRS diff swap. Gotta be nice building a hot rod over there - what with all the "help" you're getting! It's true that wheel size also matters, the S600 runs 235/60/16 wheels stock, so that's slightly bigger than the 265/35/18 or something that I'd like to run in the back. Yes correct, the Benz uses bigger wheels but also not gigantic. If I run the 2.56 BMW diff with the tire size I'm planning, it should equate to practically the same RPM in all gears as the S600 with stock wheels. A certain variation is allowed in gearing and tire sizes compared to stock. I'm not sure how much though. Thanks! Once it's all running a road trip is certainly in the plans, so that can be arranged . Apparently they changed the regulations a bit a few years ago regarding engine swaps etc and it's now much easier than before. The road handling test in Lelystad is also no more. If the car is from before 1998 all it has to apply to are the general APK requirements and some noise regulations. And if you're using stock stuff from another car with a type approval it's also easier. For cars from 1998 and onwards they are treated like a new approval and it has to fulfill all requirements of a new car. Sure, I'll make one. I was planning to do a write up about the bmw diff swap too. The bureacracy jungle is great indeed. And the Netherlands is still one of the easy countries to get things done. The real fun starts when I will get it registered in Germany. Minor update, I've been mostly been working on the brakes, making old rusty stuff look nice again on the rear suspension and collecting parts. I ordered a BMW diff now with the ratio I want (2.56:1, with the wheel size I plan on running it'll be pretty much stock rpm's in all gears like on the S600) and a factory LSD. For the brakes I 3D printed some adapters to easily test fitment, but it's not really sturdy enough so I cut 1 out of steel. The final ones will mount on the inside instead of on the outside like on these pictures. They'll be laser cut out of S355 steel. The shape will be different too, this was just something I could cut relatively easy out of steel with an angle grinder. I forgot if I posted this already or not, but a bit of background info on the BMW diffs: there are 3 different types, the small casing diff with a 168mm ring gear, the medium case diff with a 188mm ring gear and a large case diff with a 210mm ring gear. The outside of the casing varies between models, but internally there are just these 3 types. You can identify them by the amount of bolts that hold the axle flanges in place on the casing. Small casing is 4 bolts, medium uses 6 and the large case diff has 8. The small casing diff is pretty weak so I won't be going into detail about those. The medium and large case diffs are both very strong with the large casing one being the strongest (obviously). The medium case ones can be found in pretty much any (older) BMW and come in ratio's anywhere between 2.56:1 and 4.45:1 (at least here in Europe. I think the tallest one in the U.S. is 2.79:1 or 2.93:1) and can have a factory clutch type LSD. All diffs have a tag on it with the ratio and if it has an LSD there's an S in front of the ratio number. The medium case diffs have been proven to hold upwards of 700Nm of torque, depending on the ratio. The large case diffs can hold even more than that (900+Nm, depending on the ratio) and can be found on (most) M cars and V8 or V12 powered cars (except the 3.0V8 which has a medium case diff). The available ratios for these are a bit limited, between 3.15 and 3.91. There is a large case diff with a 2.65:1 ratio, but that one is rare as balls as it only came on the 850CSI with a manual trans. Just received the diff. Here you can see the difference between the small flange and the big one. It takes 30 seconds to swap them as they just pop out and the big one just pops in again. The BMW diff with the big flanges appears to be 3 or 4 mm narrower than the Volvo diff. I don't have a 1035/1045 diff to measure anymore though. It roughly measured 295mm wide from flange to flange. Don't know if I have to use some 2mm spacers on each side or if it will work as is with the CV joints. Can't wait to see your mounting solution for the diff. I'll modify the IRS subframe to use the BMW diff mounting points. The rear mounts on the 2 points on the diff cover and the front is supported on the lower right side. I plan on making that one adjustable to set the pinion angle. It's a bit of a hassle that I don't have the stock diff for measuring and fitment purposes, but it'll work. Finished one of the calipers with clear coat and new pads etc. I should have the adapters finished in a week or 2 maybe. If they fit as expected I'll do a group buy for them if there is enough interest. I'll make a set that fits the 960II too if there is enough interest. I should have the adapters finished in a week or 2 maybe. If they fit as expected I'll do a group buy for them if there is enough interest. I'll make a set that fits the 960II too if there is enough interest.